New Selection Pack Cavas with which to enjoy three excellent cavas. Give yourself the pleasure of tasting three different references with an exceptional discount of 10%. AT Roca Brut Reserva -2bot.- (Bodega AT Roca) sparkling wine of the Penedès organic viticulture. On the nose it is an elegant and fine cava while in the mouth it is fruity and fresh. 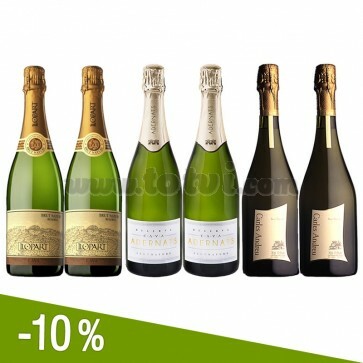 Adernats Brut Nature Reserva -2 bot.- (Bodega Adernats) sparkling pure expression of the Mediterranean. Emphasizes its aromatic intensity on the nose and fruity sweetness in the mouth. Carles Andreu Reserve Brut Nature -2 bot.- (Bodega Carles Andreu) an amazing cava made with a selection of Macabeo and Parellada. It is soft, fresh and persistent in the mouth. We hope you enjoy this selection very much as we have already done.